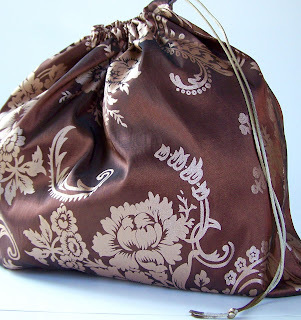 Pretty but Practical Stash Bags for Knitters and Giveaway! Last Christmas I found some stash taffeta and sewed up a simple drawstring bag for four of my knitting friends. They loved it. They found it perfect for stashing their sock in progress and slipping it into a purse or bag. 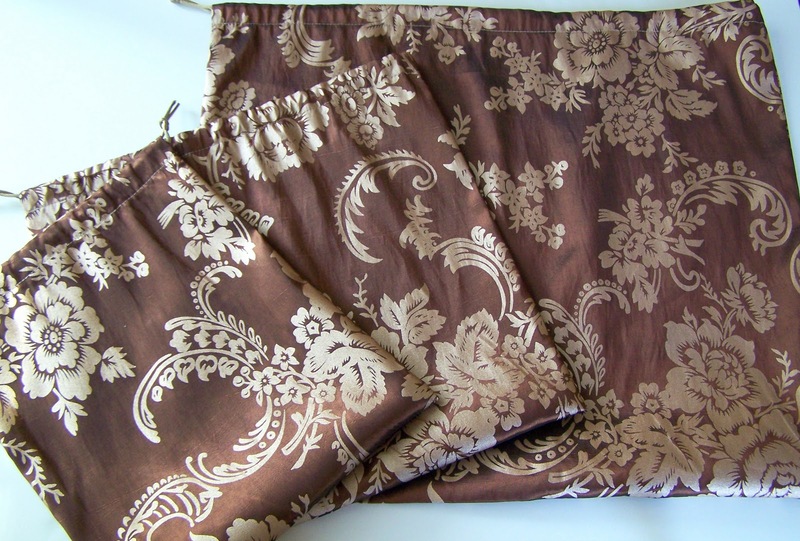 The taffeta was lightweight, yet strong – strong enough to withstand needles. 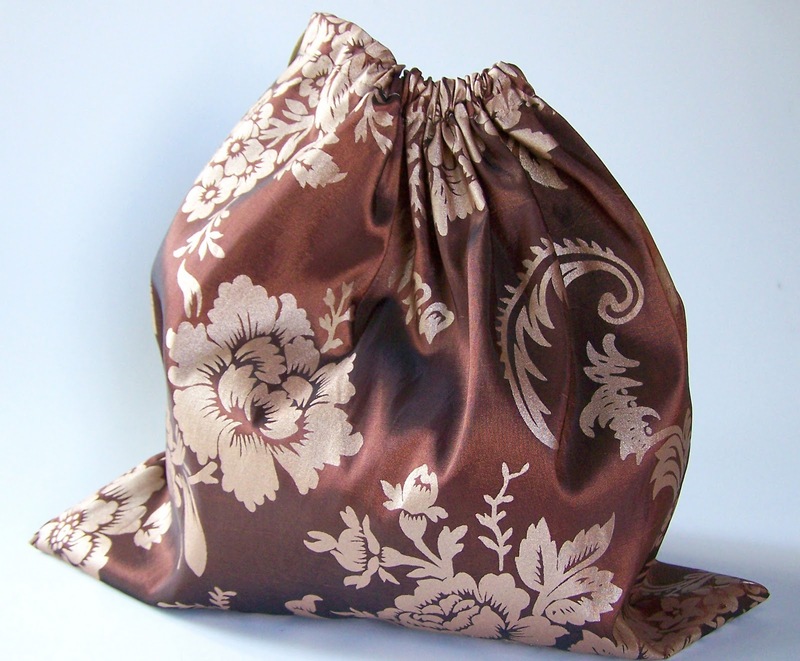 I picked up some lovely taffeta fabrics and created Taffeta Drawstring Stash bags in three sizes. The small size is perfect for socks or a small lace project. 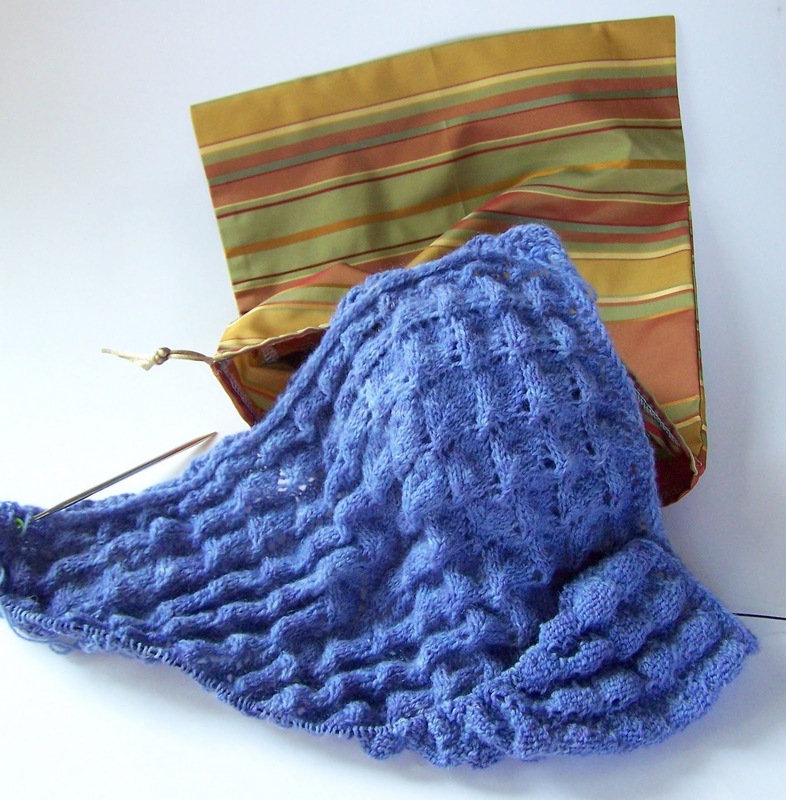 The medium size is great for a scarf, lace shawl, or sweater. Finally, the large size is perfect for bulky projects. The bag is designed with width in mind. 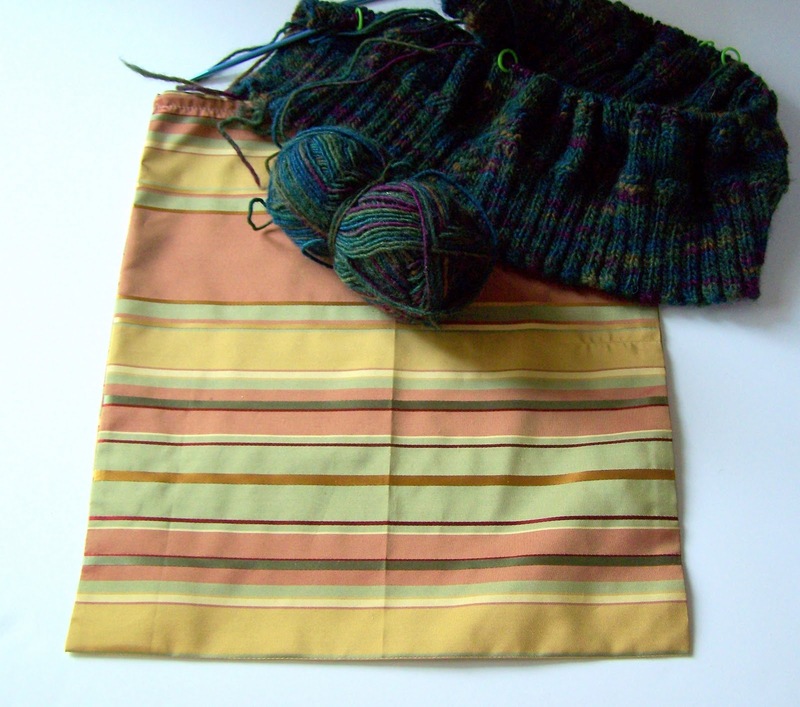 I don’t like to dig down deep for my knitting. 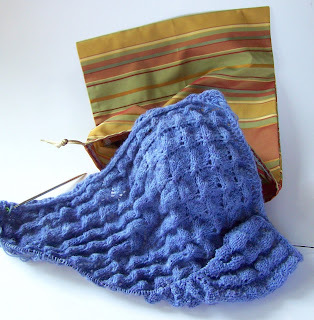 Here you’ll see the large size holding my November Ruffle Wrap. 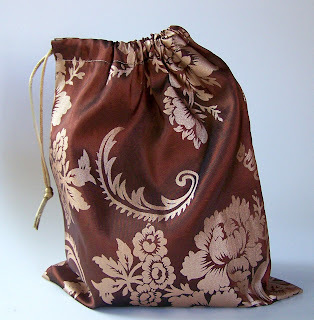 You can see all my drawstring bags at Maiden Jane’s Etsy Shop. To celebrate this new line of bags, I am hosting a giveaway. When: The contest closes Monday 10/18/10 at 8:00 AM EST. How: Leave a comment on this post and tell me how you would use the bag. If you have creative uses besides knitting I’d love to hear about it! Extra Chances: For five extra chances, “Like” my Facebook page. Be sure to let me know you did so by either writing on my wall or letting me know here. If you are already a fan of my Facebook page you could get five chances by sharing this link and/or my page with your followers. I will collect the names in an Excel file (either one or six chances) and pick a name by the random number generator. Great bags. I would give this to my mom to hold her knitting projects, which are usually things for my infant nephew, so a small bag would be perfect. Thanks for the chance to win! What a great Give away and lovely bags. 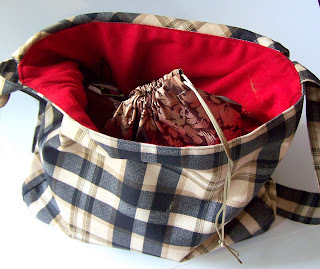 I would use the bag to keep my project in that I keep in my purse for when I am out, right now it lives in a plastic grocery bag! I’m boring, but I’d totally use it to carry around the socks that I knit. Looks like a great size and design – thanks for having a giveaway! I always have my latest projects hanging around my room causing clutter. It’d be great to have a place to put them! I don’t knit. I play tennis a lot, and rather than carry a handbag with my big tennis bag, I would carry this with me with the essentials like keys, cash, credit card. I would give this to my mom to use as she is the knitter in the family! This would be perfect as a crochet project bag, or to carry my power cords and electronic accessories (cell phone, laptop, ipod, etc.) when I travel. It would be great to have them all in one place in my suitcase. While these bags do look great for knitting, my projects have reached the large basket phase, so I would use it for embroidery, for the pillowcases I keep planning to make. love the bags-especially the larger ones. i actually have been using some of my small project bags for carrying my snacks for work or just in general when I’m running around. My bigger ones I use as a car bag for when we drive somewhere far and I load them up with projects, magazines, books, and sometimes letters to answer! Your bags are gorgeous. I would end up using them for knitting also to hold all my pills when I travel. I am diabetic & have high blood pressure so instead of carrying the pills in plastic bag it would be nice to see them in something pretty make taking them a little less blah. I *like* you on facebook! 🙂 Katy A. **Although, I am not sure if I am suppose to leave 5 seperate comments or not for the entries? I think I would use it as a pretty gift bag that the recipient could use over and over! I love the fabrics you choose for your bags! 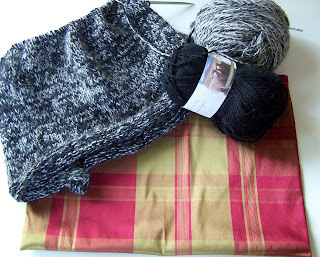 I’m always stashing works-in-progress in bags, and taking small projects along with me… I’d find lots of uses for them! I’d love to use it to wrap a pretty handmade present! I would use the small bag to hold my hats or dishcloth projects when I go to my knitting groups to knit. Great bag!!! I would use it while I travel to hold my delicates :)Perfect!!! I’d use it for drawing supplies. Pencils always poke through my purse – it would be nice to be able to tuck them away somewhere safe but handy! I’d use it for my notebooks and camera. It’d be great to just throw everything in a bag and head out to the woods or hang out on the town. This would be perfect to carry a small project in when I take my little girl to the park! Rushing right over to FB right now! I’m a commuter so much of my knitting and crocheting is done on public transportation. This little bag would be so easy to find in my backpack (usually filled my laptop, papers, and lunch). It would also to east to hang on the doorknob so it doesn’t get forgotten; sitting on the train with no crafty project always makes me sad. I’m boring and would just use it for knitting. 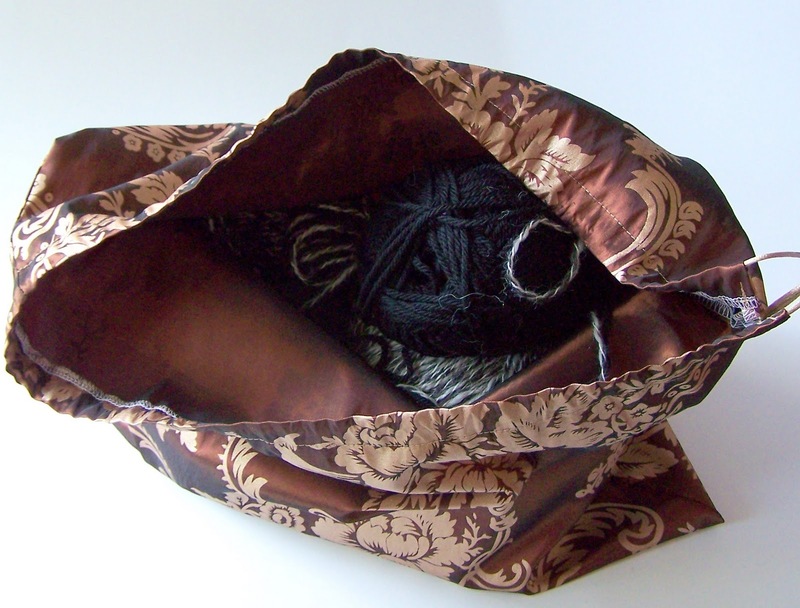 I need a knitting bag so bag, though! I’d actually give this to my aunt. She sews and she just celebrated her 50th birthday, she’d love this! Those are awesome! 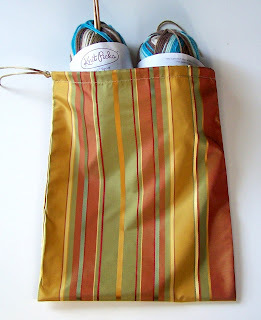 I’d use a stash bag to keep my knitting and knitterly bits like stitchmarkers and whatnot in *the same place*. Novel concept, no? Hi! 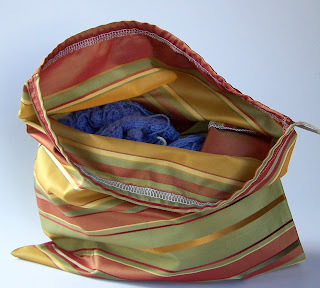 With the way the top closes, this would be better than my usual knitting project bag. Also, I just “liked” your Facebook page. Your FB page link doesn’t go to your page; you may want to check that. I did find you and “like” your page. 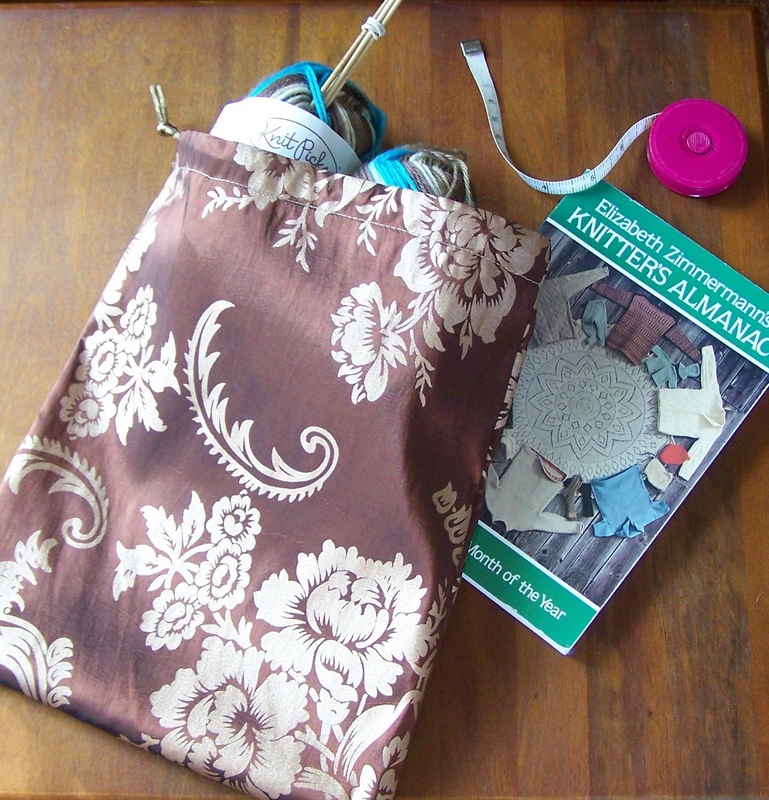 I’d use the bag for my new Kindle; it needs a little something before getting put into the knitting basket. Your bags are very pretty! Thanks for the contest. My father in law just retired weeks back and purchased a piece of recreational camp property. So hubby for our anniversary got me a small vintage 15 foot trailer. With daughter off to college this is the perfect weekend retreat that does not really cost us anything but the gas to get there! (luv that!) Wild deer come to eat from your hand, you will interrupt raccoons, fish for your dinner and the stray cats will become your best friend. I like to take a couple of projects up with me each weekend, both for car knittin, river knitting and camp fire knitting…. your bag would lovingly hold one of these projects and commune with nature! 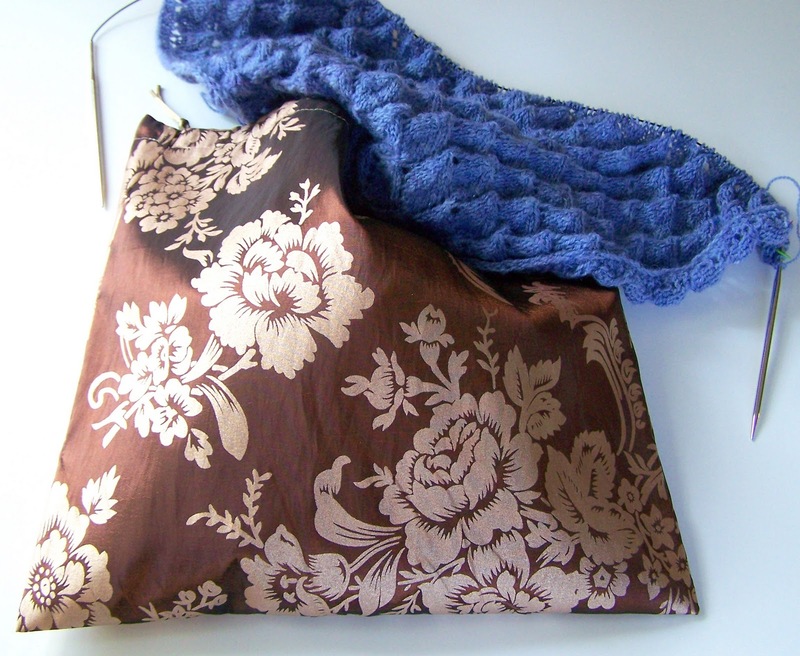 I’d use this bag as the “wrapping paper” for the scarf I knitted my mother-in-law for Christmas. I always have to carry around white board markers for teaching and it would be nice to have them all in one place in a pretty bag like this instead of rolling around in my bag marking up my papers and getting lost!! I’d use it to put all my important things (i.e. keys, phone) in when I go to the beach, and then I’d hide it in another pocket in my beach bag! Christina – [email protected] – I create 3D collages (which I show professionally) and am constantly picking up items for them wherever I go, so I’d use this beautiful, beautiful bag for this purpose! I would probably use this bag to store my extra camera lens. 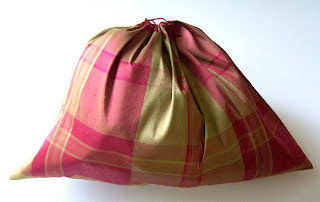 right now it’s in a green reusable grocery bag, but this would be super cute. I definitely would change back and forth more often to show it off. 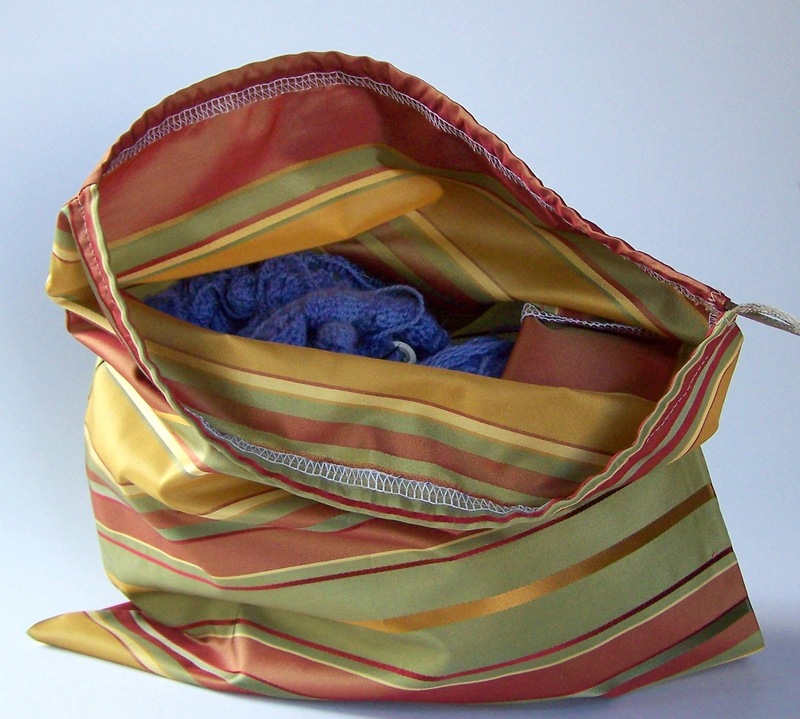 I would use the bag to store and carry my knitting board project. So many things I could put in that bag…hmmm…too many projects. 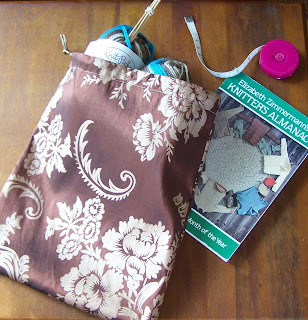 I would use it to carry around a little felt elephant I have been embroidering – the pretty bag would inspire me to actually FINISH one of my projects. I liked your facebook page as Joy Purcell. I would use the bag to pack tomatoes I buy at my farmers’ market. Oooh those bags are pretty. They would totally make great sock knitting bags. Also I think they would make great gift bags for giving handmade gifts. 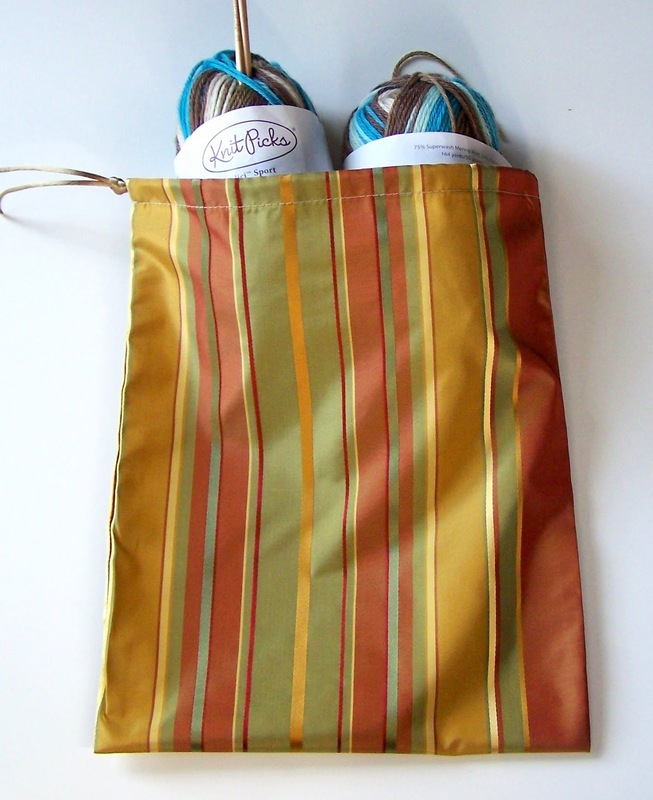 I would use this to hold all my needles and miscellaneous knitting tools! Or if it fits, I would put my netbook in it to prevent scratches in my bag. I think my iPod and my WOWBible (same size)–would be wonderful in that precious bag! I’d use it to carry my paper scraps for collage! I have scads of nifty papers, and prefer to draw them at random so I don’t obsess…this bag would be perfect! I intend on using the bag in my photo shoot with my friend! It’s absolutely perfect! And of course I’ll let them know where I go it, haha. Made it just under the wire for your giveaway! Cute drawstring bags! I’m not sure how I would use it, but I know it would be put to good use because I am sorely in need of items to help with storage and the organization of my crafts and home. Well, here’s a novel use–I volunteer in sexual health and it’d be a great size for carrying condoms to bring along to my presentations! I would give this to my Mom for her crochet projects.